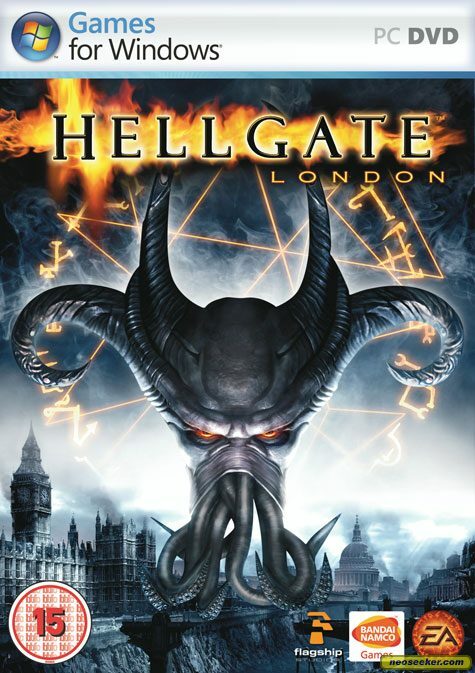 Hellgate: London is a likeable action role-playing game that answers the question "What would happen if you took all the loot lust from Diablo and fit it into a first-person shooter?" OK, maybe you weren't asking that question, but Hellgate is an interesting game. It will probably come into its own after a few more patches, but right now, it has almost as many issues as strengths. The game takes place in London, naturally, and it's the near future. A large gate to hell--some might call it a "Hellgate" of some kind--has opened and demons have been spewing forth from it. The storyline has you, as a character in one of six classes, falling into an adventure that puts you on a path to seek out various oracles, kill a whole lot of demons, and eventually penetrate the Hellgate itself. But the storyline is rather limp. It's best conveyed by prerendered cutscenes that play out between each of the game's acts, but there are hours of often poorly written quest dialogue text and flat character exclamations between those cutscenes. The game can't seem to make up its mind as to whether or not it wants to be serious or funny, and the characters that have been placed in the game for comic relief don't work very well, with the possible exception of a guy who, through your actions, ends up having a small demon hump his face for the rest of the game. The game also has a handful of technical issues, including frame rates that randomly take a dive and hard lockups that, depending on when they occur, might make you play through a significant chunk of the game again. This storyline plays out the same way whether you play offline or online, which essentially means that the offline mode is useless. The main point of this game is collecting loot and upgrading your character. Considering that you'll find a ton of loot that your character class can't use and that the most important part of tricking out your character is the ability to show it off to other people, there's no good reason to play offline. The gameplay in Hellgate has you spending time in safe locations, usually train stations, where you'll take on quests, buy or sell items, and, if you're online, interact with other players. But there are a lot of different zones tying these stations together, and they're all filled with a variety of enemies for you to shoot or stab. How you attack depends on which character class you play. There are two melee classes, and these actually play out from a third-person, behind-the-back perspective, so you can see your sword and what you're cutting. The ranged classes, whether you're shooting guns or spells, work best from the first-person perspective (though you can pull out to third, if you want). Either way, playing the ranged class turns the game into a first-person shooter...but not a particularly great one because it's more RPG than action. You get the impression that when you aim your weapon at something and start firing, all you're doing is triggering some hidden series of dice rolls that determine how hard you hit. The weapons lack impact and you end up feeling really detached from the combat.